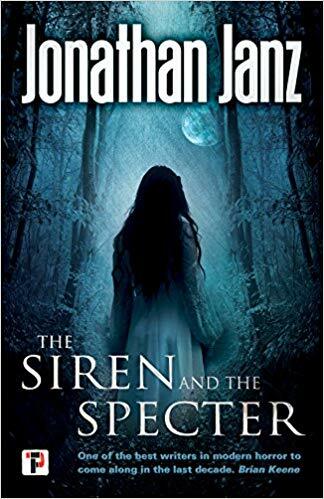 Darker and more disturbing that you can possibly imagine, The Siren and The Specter is not just the best haunted house novel I have read in years, but one of the better horror novels I have read. Jonathan Janz hooked me from the start, dragging me into the halls of The Alexander House alongside David Caine, where he made me feel the same mixture of visceral fear, self-conscious paranoia, and guilty anxiety. There is so much atmosphere to the house, and there is no better way to capture it than through the eyes of a determined skeptic. It's not just the House that makes the story, though, it's everything that surrounds it. It's the history, the geography, the character backstories, and the overarching mystery. It's the way Janz refuses to allow us to become comfortable with the story, shocking us with the perversions of the Shelby family down the lane; challenging our empathy with the full details of the suicide that so haunts David; disgusting us with the dark history of Judson Alexander; and betraying us with the revelations about the true motives of character we love, as well as those we hate. It's a story of layers, and the deeper we dwell, the heavier they weigh upon us. The supernatural aspects here are top-notch, but I loved the way Janz played with our disbelief, first forcing us to confront what seems to be irrefutable proof of ghosts, and then giving us legitimate cause to suspect an all-too-human set-up. While I initially found David's subconscious taunting of his own fears to be annoying, it really does serve to set the stage, making us wonder as much about the House as we do him. Neither doubt nor belief come easily, but that is what makes the story so compelling, especially as questions arise and it becomes increasingly more difficult to deny the evidence piling up against David's skepticism. There are a few too many coincidences necessary to bring the story together, convenient connections between characters and locations, but there are really two climaxes to the book, one each for The Siren and The Specter, and that is ultimately what allowed me to accept and embrace those connections. That small complaint aside, the story is solid, the writing extraordinarily polished, and the narrative extremely powerful. It's been a long time since I've felt so drawn to a story, so desperate to find out what happens next, to discover the answers, and even longer since I didn't come away disappointed by an ending. Highly recommended!